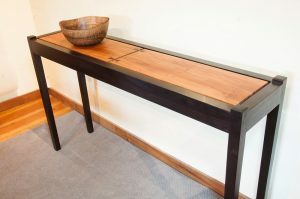 Looking for a custom piece of handmade wood furniture? Our craftsmen love a challenge and are ready to create a bedroom set, desk, side table or anything you can imagine. Because every piece of furniture is made to order, a custom piece does not have to cost significantly more than a design that you see in our gallery and showroom. We can match wood type, grain and color to work with an existing piece, modify an existing design or sit down with a blank piece of paper and build you a complete custom piece of handcrafted solid wood furniture from scratch. Our designers are skilled at taking your idea, whether it is drawn on a napkin, from a photo or right out of your imagination, and making it a reality.